Sorry it’s taken so long to share about our time in Japan! Matt worked here teaching English for two years, so he was particularly excited to return and for me to discover the wonders of this unique culture. After traveling through cheap SE Asia, the high cost of living in Japan came as a bit of a shocker. What? No tout to whisk us away to an inexpensive guest house? What do you mean we can’t bargain for the price of a room? It costs HOW much to take the bus two hours? Therefore, we’ve tackled an alternative, money-saving lifestyle that I only agreed to because we’re in Japan, perhaps THE safest country in the world… hitch-hiking and urban camping. 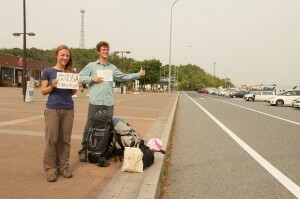 Before Japan we had hitch-hiked in Canada, France, and Israel. We still have not tried it in the US (what a scary country!) but we may have to now. A thorough Wikitravel article (wikitravel has proven to be much better than Lonely Planet) assured us that hitch-hiking in Japan – while quite rare – would be a walk in the park, especially for foreigners. Matt picked up quite a bit of Japanese while living here and can read some Kangi. We armed ourselves with these signs (recommended by the wikitravel contributor). Matt’s says, “I speak Japanese” and while you can’t see it, it also has a cute little emoticon, because the Japanese LOVE their emoticons. 🙂 Apparently mine says,“Next service area, pretty please with a cherry on top” because the Japanese also really appreciate polite language. Miraculously, usually within ten minutes of holding up these signs, someone approaches us and we hit gold. After consulting the map and deciding where to take us, we pack ourselves into the inevitably small compact car and Matt puts his best foot forward as he successfully carries on long conversations in Japanese. Except for one time when I got to converse in Spanish with the Japanese driver, I usually just get to sit and smiley dumbly as I contemplate how wonderful the driver is for picking us up. We hit gold not just in the form of a free ride (just to put this in perspective – so far we’ve saved at least $600 by hitch-hiking instead of taking trains and buses). We’ve taken at least 15 rides so far and we have been showered with gifts: Starbucks coffee, candy, ice cream, traditional delicacies (ewww red bean sauce that deceivingly looks like chocolate! ), hamburgers, and even an expensive restaurant lunch. The gift giving… Does. Not. Stop. And try as you might – and we do! – you cannot turn them down, because that would be offensive. We have been blown away by the genuine hospitality, generosity, and trustfulness of the Japanese. We never saw any other hitch-hikers and the article we read stated that most of the people who would offer us rides would never have given a ride to a hitch-hiker before. These folks have been God-sends to us and we are forever indebted to their kindness. We can only aspire to incorporate this beautiful attitude into our own lives as we pass on the gifts that have been so freely given to us. Written by: kate on April 20, 2012.on May 11, 2012.